He had succeeded to Scotland's throne after killing his predeccesor, Kenneth III in battle at Monzievaird, to the north of Crieff, on 25th March, 1005. Kenneth's son, Giric, was also killed in the battle. Malcolm later had Kenneth's grandson killed to ensure the succession of his grandson. To his name was added the Gaelic epithet 'Forranach' meaning the destoyer. Contemporary chroniclers record of him that 'He was skilled in brandishing the sword and hurling the spear' and that he was ' A victorious warrior in battle.' He was the first to reign over the extent of land equivalent to modern Scotland. 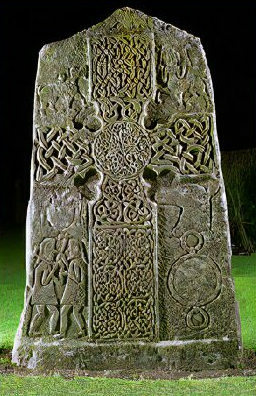 Malcolm, an intelligent and ambitious man, married his daughter to Sigurd, the Viking Earl of Orkney. When his son-in-law was killed in battle in Ireland, his Scottish lands were divided between the Mormaer of Moray, who was married to Malcolm's sister and Sigard's son, who was also Malcolm's grandson. He married his elder daughter, Bethoc, to Crinan, lay Abbot of Dunkeld, from this fateful union was to spring the House of Dunkeld. 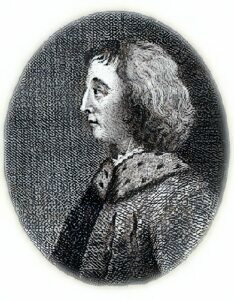 Malcolm II invaded England , believing the English too preoccupied with the Danish raids to successfully withstand a Scots invasion. Unfortunately he was wrong and they defeated him at Durham in 1006. The English were lead by Uhtred, the son of Waltheof I, ealdorman of Bamburgh, and known as Uthred the Bold. Uthred gathered men from all over the regions of Bernicia and Yorkshire to halt the King of Scot's advance. The severed heads of the Scots killed in battle, after being washed by local women, were fixed on stakes to Durham's walls. Malcolm himself escaped from the bloody battlefield alive. Uhtred was rewarded by King Ethelred II with the ealdormanry of Bamburgh for his part in the victory. The King of Scots allied himself with Owen the Bald, the King of Strathclyde and together they burnt much of Northumbria. He defeated Earl Uhtred at the Battle of Carham on the river Tweed. Earl Uhtred was klled in the battle. Canute, the Danish king of England, appointed his brother-in-law, Eiríkr Hákonarson as Earl of Northumbria. Canute responded with alarm, sending an army north to deal with the troublesome Scots King and seized Lothian. According to the Anglo-Saxon Chronicle, Canute led an army into Scotland on return from his pilgrimage to Rome. Burgundian chronicler Rodulfus Glaber records that peace was made between Malcolm and Canute through the intervention of Richard, Duke of Normandy, who was Canute's brother-in-law. Malcolm died on 25th November 1034. The Annals of Tigernach record that "Máel Coluim mac Cináeda, king of Scotland, the honour of all the west of Europe, died." John of Fordun states that Malcolm killed fighting bandits, The Prophecy of Berchán records that he died by violence, fighting "the parricides", suggested to be the sons of Máel Brigte of Moray. Malcolm left no sons and named his grandson, Duncan I, son of his daughter Bethoc, as his successor.